Staircases are one of my Favorite Subjects when it comes to Minimalist Photography. This White Staircase I found at the "Jharkhand Mahadev Temple" located at Vaishali Nagar, Jaipur, India. Apart from the above shot, I have clicked many other Minimalist Photographs from this place. The architecture of the Temple is very simple and geometric. I guess in old times, people understood the value of Simplicity and Utility. And of course, since this is temple area, it need not be very modern. I like going to this place often, for the vibes are amazing. You must visit this small Temple for sure when you land up in Jaipur sometime for a vacation. Coming back to the composition, the Minimalist Photograph of the White Staircase above, falls nicely under the Minimalism as Simple Geometry Category of Minimalist Photography / Minimalism. The Simple Geometry being Lines and its combinations. 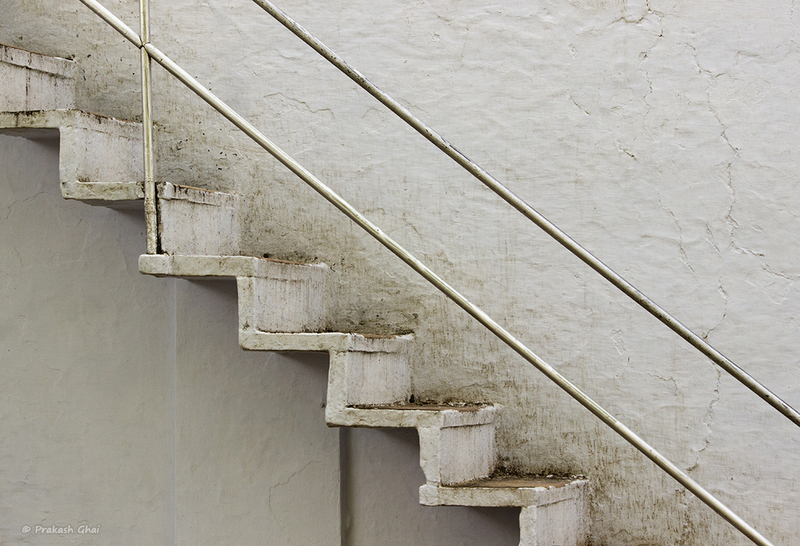 The subtle texture and dirt on the staircase and the White wall, creates a nice artsy feel. I took this shot a little from the side, to create a sense of depth. I have kept everything basic and simple this time.